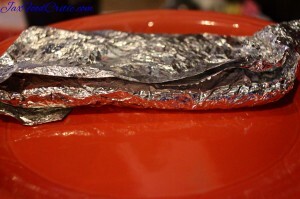 One of my friends from work kept going on and on about this place called Salsas on the corner of Beach Blvd and Hodges. I should have believed him and went earlier. Food: Yes, I’m cheap, I love a restaurant that gives out free bread or in this case, free chips and salsa. 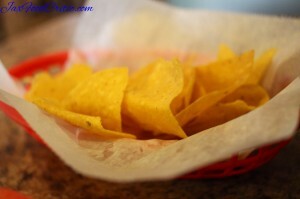 I know, just about every Mexican restaurant gives out free chips and salsa, but the fact that I can eat my own body weight in it, well….I’m sure they hate to see me come in. Hot chips are addictive. As you can see from the picture, there is nothing out of the ordinary with the chips and salsa. The chips were slightly on the stale side, but that might be me just being hyper critical. The salsa tasted fresh and had a nice taste to it. I’m a sucker for fajitas. I think because somewhere in the back of my tiny brain I think that if I eat too much chips and salsa, the fajita is about one of the only things that you can reheat and it will taste pretty good the next day. Everything else gets soggy and nasty. 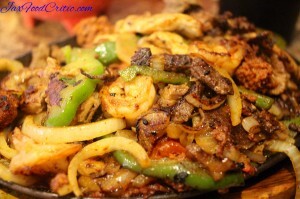 I ordered the Parillada Mexicana (for one) $13.99 (Menu Description: pork tips, shrimp, chicken, chorizo & steak). I like my fajitas to have a little bit of everything and this one did. The chorizo was awesome. It pretty much flavored everything nicely, just with that. The vegetables were nice and fresh. They went heavy with the meats, and I appreciate that. My only complaint would be that the steak was on the fatty side. That would be the one and only thing I would change about this dish. It was a huge portion and it was very tasty, I would recommend this and will probably go back, just for that alone. 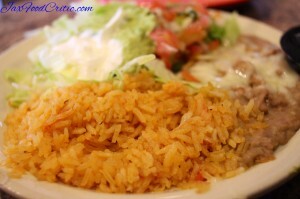 Extras: This was a pretty easy meal but sometimes Mexican restaurants still mess up on them. Salsas did not. 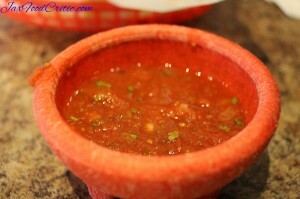 I would rank Salsas over La Nop now. Oh, and there was plenty of soccer to watch, you know, if that’s your thing Want to check out the La Nopalera review? Click on the name silly. – Steak in the fajita was a little on the fatty side.